…in your shipment, you will most likely be repairing or replacing these at destination. If your shipment is destined for the United States, replace¬ment costs of goods of like, kind, and quality could be less than those in your country of origin. Conversely, the cost to replace goods outside the United States could be significantly higher. Many times your employer can assist in determining how to value your household items for insurance purposes. ..Don't declare a value for living things, perishables, money, securities, valuable papers, documents or data stored on tapes or disks as these items are excluded from coverage. Also, since reimbursement for items of sentimental value is limited to the estimated re-sale value of such items, don't overvalue them. We recommend that you carry these items with you or that you simply refrain from shipping them. …within your residence and value them at the estimated replacement cost at destination. You may either use any form you have available including inventories contained in various computer programs. …please consider that these items are to be valued in a slightly different fashion than household goods. You should declare what it would cost to purchase a similar item at destination taking into consideration the year and condition of your automobile, motorcycle, or boat. Please note that the value of imported autos, motorcycles, or boats may be considerably higher than the value at origin. If you have requested to arrange transportation on a door-to-door basis …coverage continues through the ordinary course of transit until your shipment is delivered and unloaded at your new residence. If your shipment is placed in storage for longer than the storage period provided in your policy, you should extend your coverage and remit the appropriate premium to keep coverage in effect. If you have contracted moving services on a door-to-port basis, coverage will cease when your shipment arrives at the port. Breakage, scratching, denting, chipping, staining and tearing of goods you packed yourself. Loss or damage caused by inherent vice. Depreciation in value caused by substandard repairs. Pairs & Sets: The standard policy will pay only for that part of a pair or set that is actually damaged or lost. Mechanical Breakdown: The standard policy excludes coverage for equipment that is dis¬covered to be inoperable at your destination unless there is clear evidence of damage to the item itself or the shipping container. Mould & Mildew: The standard policy excludes coverage for damage to items caused by mould or mildew resulting from a change in atmospheric conditions during transit. In the event of loss or damage to any item or items forming a pair or set, consideration will now be given for the fair reduction in value of the pair or set, taking into consideration the importance of the lost or damaged item to the pair or set. In the event of loss or damage resulting from a change in climate or atmospheric conditions, coverage can now be extended to cover your goods for mould and mildew. This coverage option is only available if your goods are professionally packed. Coverage will now be extended to include loss or damage to electronic/mechanical items where no clear evidence of damage to the item or its shipping container is visible. It is important to note, however, that this coverage only applies to items 6 years old or newer as well as to those items that have been professionally packed in accordance with manufacturers' specifications, where possible. 1) The policy provides 60 days storage insurance protection at origin and 60 days at destination provided the shipment is stored in a commercial, enclosed warehouse. Coverage can be extended for an additional period of time by the payment of an additional premium. 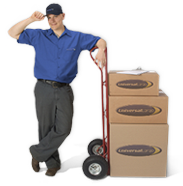 Note that coverage cannot be extended when your shipment is placed in a self-storage warehouse. 2) There is a common misconception that you may select any level of insurance protection you desire and that your shipment will be insured up to that amount. This is true if you sustain a total loss but not true if you have a partial loss.